Right so that's me done. A great start to the season in terms of entertainment at Stamford Bridge. Not sure Jose Mourinho always likes it like that, though. Next up for Chelsea is Manchester City, a week on Sunday. We haven't seen City perform yet but you might expect that Chelsea will need to improve on today's showing. So the thrilling draw at Stamford Bridge lands it second in the Match of the Day running order. You can watch highlights of all today's games on BBC One at 22:20 BST. Watch out for Swansea's Jefferson Montero. I saw it in real time. It was a difficult one to make out. I think it was a bit harsh but it was a decision the referee had to make. I thought our performance warranted at least that point. We went for it and showed our attacking prowess. With you on that one Warind. Don't think too much can be read into the result and Chelsea did come away with a point. Jose Mourinho has just alluded to his players not being in top condition. That's not a situation which will last for long. They didn't have chances against 11. The team was playing very, very well in the first half. In the second, in one minute, it was a penalty, red card and the goal - 2-2. If you have 10 men and are winning you can defend well and try to find a strategy but to play with 10 men and try to win the game is more difficult. I would say we were the best team with 11 players and with 10 we fought hard, some fighting at the limit of their condition. "It wasn't that nice being a defender, I would have liked it to be tighter but a point at Stamford Bridge is always welcome. When you come back from one goal down here, it's a big thing. If we did that at the home of the champions, you know we've put in a shift." The merits of those long-haul pre-season tours might be called into question after that performance from Chelsea. However, they aren't the biggest travellers this summer. Both Manchester City and Liverpool have chalked up over 20,000 miles each so it will be interesting to see how they do against West Brom and Stoke respectively. So Swansea were the only team to score twice at Stamford Bridge last season and they've done it again today. Great game to kick off the season, although Chelsea might not think so. Still a few cobwebs, clearly. As the players leave the field, John Terry is asking a few questions of referee Michael Oliver. Perhaps about the merit of the penalty given away by Thibaut Courtois, who was sent off for his actions? No time to take it. All over. Fine game. Free-kick swung in by Nemanja Matic but easily headed away. Swansea on the attack now and win a free-kick on the near side near the half-way line. Nope. Chelsea head clear as Eden Hazard streams forward and draws a foul from Ashley Williams. A few signs that the Belgian is starting to find his stride. Corner to Swansea. Near post number again? Four minutes of stoppage time as John Terry appeals a free-kick awarded to Swansea. Getting a bit frantic now. If Jefferson Montero was still on, I reckon Swansea would be ahead here. Still time. Diego Costa wants a foul after being clipped near the box by Ashley Williams but referee Michael Oliver is not interested. Diego takes it really calmly as usual! Swansea substitute Eder is a big old lad but keeps giving away free-kicks since coming on. Andre Ayew is giving Cesar Azpilicueta some lip after the Spaniard hangs onto the ball for too long but they are friends again soon afterwards. Sweet turn and break by Eden Hazard, who feeds Radamel Falcao but the Chelsea striker drags his shot a touch and Lukasz Fabianski saves low to his right. Five minutes to go plus stoppages. The game is starting to open up as the crowd hope for something special. Swansea won't have many better chances to beat the champions. Quote Message: In the couple of games Radamel Falcao has played, he hasn’t really looked like scoring. When you watch Falcao up close his movement is exceptional. I feel last season he was in a struggling Manchester United side. At Chelsea he has a few more South American players around him, he's in London, feeling a bit more loved, it might help him." In the couple of games Radamel Falcao has played, he hasn’t really looked like scoring. When you watch Falcao up close his movement is exceptional. I feel last season he was in a struggling Manchester United side. At Chelsea he has a few more South American players around him, he's in London, feeling a bit more loved, it might help him." Eder already proving a handful for John Terry. Willian makes way for Radamel Falcao, who rekindles his striking days at Atletico Madrid where he partnered Diego Costa up front. Radamel Falcao is readying himself for his competitive Chelsea debut. Ten minutes or so to make a name for himself at Stamford Bridge? Swansea's Andre Ayew has already played his part today as he seeks to add to his opening goal for the visitors but his shot is straight at Asmir Begovic. 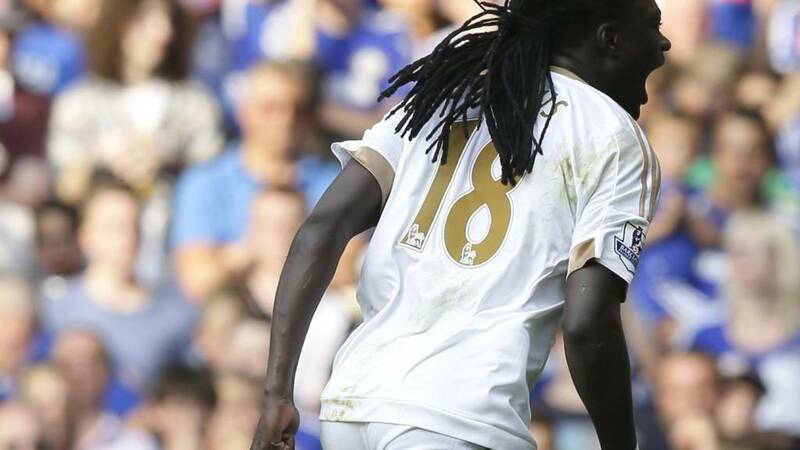 Swansea goalscorer Bafetimbi Gomis is replaced by debutant striker Eder. The 27-year-old arrived from Portuguese side Braga last month. Chelsea keeping the ball now, they'll be more than happy with a point from this position. Three would be a great achievement. Cesc Fabregas is off and replace by Kurt Zouma to add bite to the midfield. As soon as I type that last entry, Chelsea are away and Eden Hazard takes on left-back Neil Taylor before drawing a near-post save from Lukasz Fabianski. Chelsea will be doing well to hold onto this. That's not a sentence many would have predicted at the start of the game today. Swansea's Wayne Routledge is straight into it as he is played in by Jonjo Shelvey. He cuts inside from the left but his shot is well saved by Asmir Begovic. Can I remind you of an earlier post discussing the merits of long-haul pre-season tours? See 17:11. Jefferson Montero is on the floor with an injury and he's off which will be a huge relief to Chelsea. He's been the best player on the field. Wayne Routledge is on. Bafetimbi Gomis has the ball in the back of the net after a lovely passing move in the build-up to Neil Taylor's cross. Alas, the Swansea striker is offside. Swansea have done their homework on corners. They know that Chelsea do not have a player on the posts and Thibaut Courtois, since departed, and Asmir Begovic like to come off their line. So Jonjo Shelvey fires another one at the near post which has the Chelsea goalkeeper scrabbling. I'm not making this up. Jefferson Montero is again on the attack and drives into the box, checks and fires a shot which is turned over by Asmir Begovic. Jefferson Montero, who else, tests Asmir Begovic with a low shot. Swansea aren't settling for a draw here. Replays of that incident show that Willian was the player to play Bafetimbi Gomis onside, and Thibaut Courtois appeared to catch the Swansea striker right on the edge of the penalty area. It was a tight one but the officials looks to have got it spot on. Bafetimbi has missed a few chances during this game and makes no mistake placing it to Asmir Begovic's left. Bafetimbi Gomis is played through, Thibaut Courtois catches him and Michael Oliver is sure of his decision. The Chelsea goalkeeper is off and Oscar is replaced by Asmir Begovic for his Chelsea debut. And an equaliser is tantalisingly close. Jonjo Shelvey whips over a low corner and it hits the near post. Thibaut Courtois was inching out of goal anticipating a deeper cross and looked very nervous as he clawed his way back. Guess what Jefferson Montero has it once more and wins another corner. A subsequent Swansea corner is headed over by Federico Fernandez, who beats John Terry in the air, and has plenty of reasons to get on the scoresheet. Gylfi Sigurdsson's free-kick has plenty of fizz but clips off the top of the wall for a corner. That set-piece arrives at the feet of Bafetimbi Gomis, but he is wasteful again. Jefferson Montero is on the attack again and draws a foul, about 25 yards out. Interesting. Chelsea get us under way. No changes. If you want an illustration of the tempo of this game, Willian has made 41 sprints in the first half, more than any other player. Memphis Depay was the leading sprinter in Manchester United's win over Tottenham, with 42, and that was in 68 minutes. You can't accuse the two teams of serving up a continuation of pre-season. Plenty of action in both boxes. SMS Message: Boom boom boom everybody say Ayew! Ayyyeeeewww!! from Ross in Kent. Boom boom boom everybody say Ayew! Ayyyeeeewww!! A balmy glow at Stamford Bridge as referee Michael Oliver brings the half to a close. A very good one too. Swansea perhaps unlucky to be behind. Jack Cork, a former Chelsea academy graduate, brings down Willian, who was in danger of breaking away. Tactical foul. Oscar delivers the free-kick, but it is nodded away by the Swansea defence. Three minutes of stoppage time. The secret to this game so far has been good wing play. Jefferson Montero is doing the damage down Swansea's left, Eden Hazard down Chelsea's but here is the Belgian on the right wing now and wins a free-kick. Our friends at Opta say that Andre Ayew has scored in eight of his last 14 league game (in France and England), including four of his last six. Jose Mourinho looking on pensively in the west London evening sunshine. His defence is looking vulnerable. Ki Sung-yueng is coming off and is replaced by Jack Cork. Good point Joseph. I didn't do Andre Ayew's debut goal justice. He dragged the ball back superbly to make room for his finish. Ki Sung-yueng is down with what looks like a hamstring problem. If you haven't watched him before, Ecuador's Jefferson Montero is a great player to watch on Swansea's left wing . He is giving Branislav Ivanovic a good run for his money already. Frantic tempo to this game but in amongst the chaos, Swansea have been creating chances and they will feel they can score again. Andre Ayew and Federico Fernandez have now scored their first goals for Swansea. Unfortunately for the latter, it was not as memorable as for the former. Heartbreak for Swansea. 90 seconds after drawing level, they are behind again and it's a fluke goal. Willian crosses low into the box and Federico Fernandez deflects the ball up and lopping over Lukasz Fabianski's head. Cruel. Wow. Jefferson Montero crosses into the box, Thibaut Courtois saves Bafetimbi Gomis's header, but Andre Ayew tucks in the rebound on his debut. Cesc Fabregas, great player as he is, does frustrate at times. Twice now he has been in good positions to shoot but opts for a more difficult option. He used to play for Arsenal and Barcelona, don't you know. The flow of the game has changed now. Chelsea more comfortable as Swansea begin to stand off their opponents. Willian flashes an angled shot wide from 25 yards. Chelsea defender Gary Cahill was inches from nudging that goal in, which probably put Lukasz Fabianski off. Swansea fans may wonder why no-one was at the near post to clear. Oscar takes a free-kick from deep on the left, he hits it low and no-one touches it as it fizzes in at the back post. Disappointing for Swans keeper Lukasz Fabianski. There looked like a few empty seats at kick-off, so now we know why. Great start to this match. In amongst all that Swansea's Ki Sung-yueng also had a shot beaten away by Thibaut Courtois. Swansea are showing no fear at Stamford Bridge. Oscar plays Chelsea's Diego Costa through now but Federico Fernandez stretches within an inch of his life to clip the ball behind for a corner. Costa is livid, he thinks it's a penalty and smashes the ground in frustration. Great chance for Bafetimbi Gomis again! This time he is played through by Jonjo Shelvey, clean through on goal but dawdles on the ball and Chelsea recover. Can Chelsea win the Premier League? "I think Chelsea are the team to beat, they have to be. They set such high standards last season. "Manchester City are the best equipped to challenge them. Their squad is strong. Fabian Delph is a terrific signing, Raheem Sterling is a good signing but he needs to improve and find a position in that side." Andre Ayew, Swansea's June capture from Marseille, has started on the right for the Swans and is being ably supported by right-back Kyle Naughton as Jonjo Shelvey fires in a low cross which Thibaut Courtois gathers. Nice tempo to this game as Eden Hazard, who looked lacklustre last weekend, slips a ball through to Diego Costa but it's just too heavy for his team-mate as Lukasz Fabianski intercepts. Bafetimbi Gomis beats Branislav Ivanovic to the set-piece and heads narrowly wide. Very close. Jefferson Montero is on the attack on the left wing for Swansea, and wins a corner. Oscar plays a lovely ball through to Diego Costa, who cannot reach it. But the Brazilian midfielder Oscar has taken a knock to the face from Ki Sung-yueng. He's up and about and seems fine now. Chelsea pressing from the front, a clear increase in tempo from the Community Shield last Sunday. Oh yeah, and Jose Mourinho means business. He's wearing a suit. Nice touch by Oscar sets up a counter attack as Willian wins a corner. Swansea clear at the near post and Diego Costa, sporting a nice new haircut, cannot keep the ball in after a subsequent cross. Swansea get us under way. Right, the players are out, Stamford Bridge is bouncing and we are almost ready. "Garry Monk will look to make further inroads into the top 10 and key to his hopes will be how Andre Ayew, who could be a real coup on a free transfer from Marseille, settles to his task. "He could form a productive link with Bafetimbi Gomis, if he stays, and elsewhere this Swansea side looks a good mix of all the qualities needed to be in the top half again, led by one of the Premier League's emerging young managers." Thibaut Courtois is down the tunnel and looks fine to start after injuring his right knee in the warm-up. Panic over. This was Chelsea goalkeeper Thibaut Courtois before he was injured in the warm-up. The players have disappeared now so we are waiting to see if the Belgian will play? Can Swansea repeat last season's efforts? Don't forget that Swansea achieved a record Premier League points tally (56) under Garry Monk last season. Can they reach those heights again under the canny boss? So it's been a relatively quiet summer in the transfer market for Chelsea. Does that mean it will be closer at the top than last season when they won the title with three games to spare? Statistically, Chelsea are the best 'opening day' team in Premier League history with a record of P23 W15 D5 L3. Wonder if Thibaut Courtois's problems will make any dent on that? Thibaut Courtois has been kicking a few balls around after an injury in the warm-up and is now off down the tunnel. He's also had a quiet word with Asmir Begovic, who could be in line to make an early debut and is out on the pitch warming his hands with a few shots. Last season was an impressive one for Swansea, despite finished eighth some 31 points behind Chelsea. However, one thing may be in their favour this evening. Former Liverpool fitness coach Darren Burgess told me this week that teams who have travelled less in pre-season can often start the season well. Chelsea clocked up 9,800 miles on their trip to north America, while Swansea opted for a shorter trip to Germany, racking up just 1,900 miles in comparison. Well, Chelsea goalkeeper Thibaut Courtois is in the team, but he is getting treatment after appearing to hurt himself in the warm-up. He's up and about but we will keep you posted on his condition. That's right, for Mourinho and co, the real business starts here as the Portuguese manager, fresh from signing a new four-year contract, chases his fourth title with Chelsea. He's already had his first tiff of the season (with Arsene Wenger last Sunday), and he won't be keen on a similarly lacklustre performance in the 1-0 defeat by Arsenal. Last week at the Community Shield at Wembley, Chelsea boss Jose Mourinho very much looked like someone who was still on his holidays. Will he don his suit as the champions kick-off their Premier League title defence?